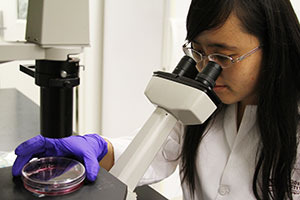 Xiaowei Liu examines cells to test whether DNA nanostructures could reside comfortably within the appropriate compartment of the cells and be stable for several hours—-long enough to set in motion an immune cascade. Scientists at the Biodesign Institute at Arizona State University are using DNA nanotechnology to make an entirely new class of synthetic vaccines that could be delivered by piggybacking onto self-assembled, three-dimensional DNA nanostructures. In a quest to make safer and more effective vaccines, scientists at the Biodesign Institute at Arizona State University have turned to a promising field called DNA nanotechnology to make an entirely new class of synthetic vaccines. In a study published in the journal Nano Letters, Biodesign immunologist Yung Chang joined forces with her colleagues, including DNA nanotechnology innovator Hao Yan, to develop the first vaccine complex that could be delivered safely and effectively by piggybacking onto self-assembled, three-dimensional DNA nanostructures. The core multidisciplinary research team members also included: ASU chemistry and biochemistry graduate student and paper first author Xiaowei Liu, visiting professor Yang Xu, chemistry and biochemistry assistant professor Yan Liu, School of Life Sciences undergraduate Craig Clifford and Tao Yu, visiting graduate student from Sichuan University. Chang points out that vaccines have led to the some of the most effective public health triumphs in all of medicine. The state-of-the-art in vaccine development relies on genetic engineering to assemble immune system stimulating proteins into virus-like particles (VLPs) that mimic the structure of natural viruses—minus the harmful genetic components that cause disease. First, the group had to prove that the target cells could gobble the nanostructures up. By attaching a light-emitting tracer molecule to the nanostructures, they found the nanostructures residing comfortably within the appropriate compartment of the cells and stable for several hours—-long enough to set in motion an immune cascade. With the ability to target specific immune cells to generate a response, the team is excited about the prospects of this new platform. They envision applications where they could develop vaccines that require multiple components, or customize their targets to tailor the immune response. Furthermore, there is the potential to develop targeted therapeutics in a similar manner as some of the new generation of cancer drugs. The work was supported by funding from the Department of Defense and National Institutes of Health (National Cancer Institute, National Institute of Drug Abuse). Be the first to comment on "New Class of Synthetic Vaccines Piggyback on 3-D DNA Nanostructures"